There are a million bits in records – not necessarily the whole track – that stick in the brain and when re-heard trigger some sort of euphoric high in the brain. Off the top of my head, the galloping acoustic rush as Johnny Marr leads The Smiths into Bigmouth Strikes Again, The Clash going full pelt on White Riot, the popping bass intro to Sly & The Family Stone’s I Get High On You, the 14th fret D chord that fills every second line in Rip It Up, Liz Fraser’s voice on Song To The Siren, the gear-changing riff on The Breeder’s Cannonball, the stomping goosestep that opens Holidays In The Sun, the wild-eyed storm at the end of The Beatles’ Helter Skelter, the clattering industrial funk that holds Happy Mondays’ Mad Cyril loosely together, the bit in I Am The Resurrection when Mani’s riff kicks in and the whole band head off into an episode of Starsky & Hutch for 5 minutes, Marvin Gaye’s ‘Up early in the morning!’ when the Funk Brothers momentarily drop out on Can I Get A Witness.….That 10 Favourite Albums thing that’s doing the rounds just now on Facebook is good fun ‘n all, but if you were to ask me my 10 favourite bits in music, I reckon I’d be at it, one a day, for months on end. And I’m sure any of you reading this would be similarly challenged. 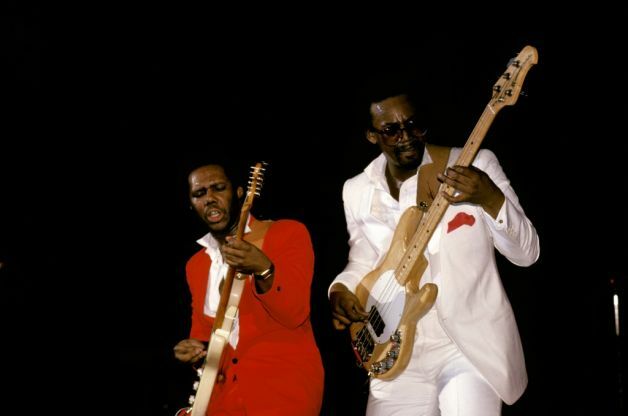 There’s no doubt though (this week at any rate) that the sound of Nile Rodgers and Bernard Edwards playing together is just about my favourite sound in music. Nile, with his chattering funk guitar, all major 7ths with extra pinky action, found the perfect foil in Bernard (pronounced with the emphasis on the 2nd syllable – it rhymes with ‘hard’ (just like those bass lines he plays)), a seasoned jazz player who ran up, down and across the 4 strings under his fingers with an effortless glide. When the pair of them lock into a groove it’s like an old married couple nattering over the kitchen table, Nile leading the conversation with positive excitement, Bernard uhm-ing and ah-ing in contended agreement. Listen to their playing on Sister Sledge‘s Thinking Of You. 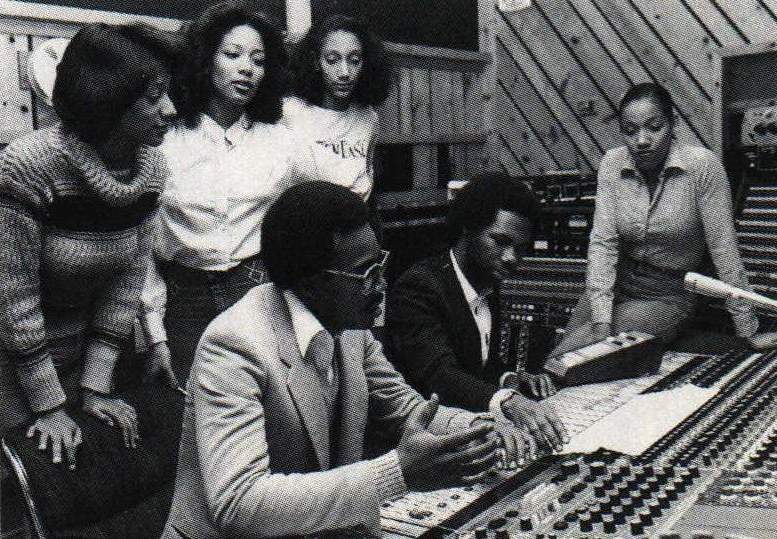 Rodgers’ idea for Chic was always that they’d be a hit-making machine writing songs for others as well as themselves. They’d have their own act, Chic, who took their cue from Roxy Music by dressing to the nines and fronting the band with a couple of glamorous females who wouldn’t have looked out of place on a Roxy album sleeve. 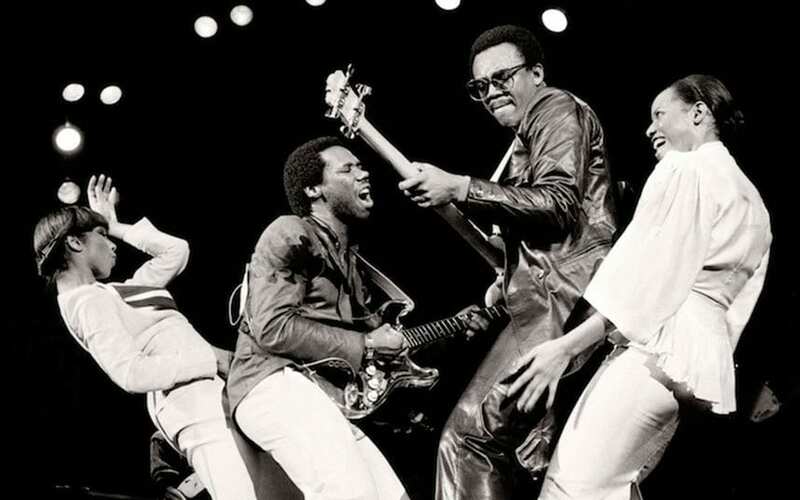 Chic ran up all manner of hit singles; Le Freak, Everybody Dance, I Want Your Love….. and when Nile and Bernard weren’t guiding them to chart success they were busy helping others fill the gaps in the charts they’d just vacated. The Chic Organisation played on all manner of records, a disco-era house band akin to the Funk Brothers at Motown or the Wrecking Crew in LA. And the best thing about those Chic Organisation records is that every one of them sounded exactly like Chic themselves. Take the Sister Sledge record above. It opens with that none-more-recognisable Rodgers’ guitar sound, played high up the frets on the first 3 or 4 strings, simple enough to listen to but devilishly difficult to play with the same bounce as its writer. When Edwards’ bass comes in along with the vocals, the whole thing takes off in airy abandon. And away we go. Strings sweep up and down, the bass drops in and out, congas and pitched percussion keep the whole thing groovy and the sisters Sledge sashay on the spot, ice-cool four-part harmonies and backing vocals from beginning to end. The Chic Organisation thought the finished track was just OK and stuck it on a b-side. A b-side! The a-side? That would be Lost In Music. Thinking Of You finally gained chart success in 1984 when a down on their luck Sister Sledge were releasing records to ever-diminishing returns and some clever soul at the record company pointed out that that old b-side from 5 years ago hadn’t been too bad after all. By this point, Rodgers was working with Bowie and Madonna, his sound forever in demand. Listen to Let’s Dance or Like A Virgin and you’ll hear his clipped guitar all over the records like a happy rash. Not for nothing has he nicknamed his white Strat ‘The Hitmaker’. A few years ago we (I say ‘we‘ – I’m part of a group who put on local gigs) were looking for a headline act. 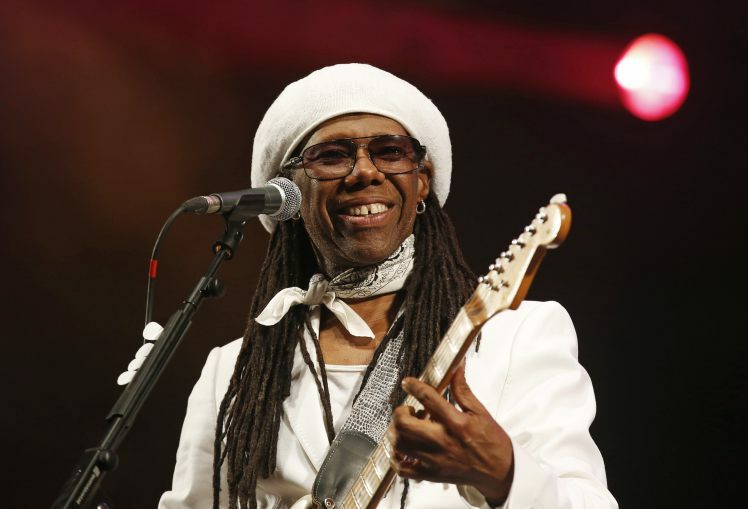 We had enough money for either Nile Rodgers or The Magic Numbers, but not both. Nile lost out on the vote, which greatly upset me…..and the others when he popped up a few months later owning the stage at Glastonbury, at that very moment reborn. Our Magic Numbers gig a few short weeks later was great, but, y’know, not Nile Rodgers great. Nowadays, believe me, you could probably fund a Magic Numbers World tour for less than the cost of putting on Nile for one night. On stage, Nile plays with a smile as wide and long as the zeros on his royalty cheques. And who can grudge the man! He’s survived a very disfunctional childhood. He’s beaten cancer. And he seems like an all-round decent man. If you haven’t already, you really should read his book. Taken from his Studio 150 album, clearly a contract-filling album if there ever was one, Weller treats the original with politely-scrubbed acoustic respect but not the required funk. Dmitri From Paris takes Sister Sledge’s original and turns it into a rolling, soulful house cut. Sensibly, he keeps all of Edwards’ and Rodgers’ parts. There is, after all, some music DNA that you just don’t mess with. Really enjoyed revisiting this particular song and reading about Nile. He looks like the cat that got the cream most of the time nowadays, and I suppose he has. Thanks for stopping to comment, Alyson. Cheers!